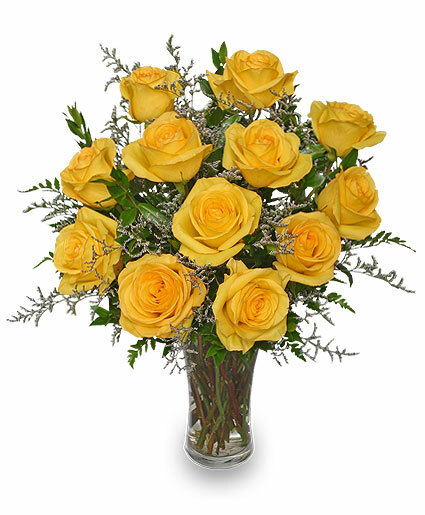 12, 18 or 24 yellow long stem roses professionally designed for you in a tall glass vase! An un-traditional view of our premium Ecuadorian roses. This hand crafted wood crate displays 15, 18 or 21 roses in a compact and high impact design, great for small spaces. 6 roses, arranged in a clear glass ginger jar, perfect for home or office. This display can be paired nicely with an add-on box of Godiva Chocolates or scented candle by The 1803 Candle Company! 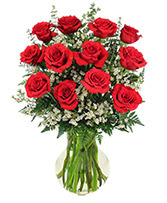 Show your love, passion, and gratitude with a classic dozen red roses. 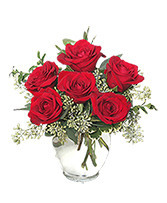 Accented with white waxflower, an arrangement this full of love is sure to please! Don't forget to add on a Mylar balloon or Godiva Chocolates! The mid-range display has 18 roses, premium contains 24!